A table is a very useful way of organising information. Within the editing area put thre cursor where you wish to insert the table. 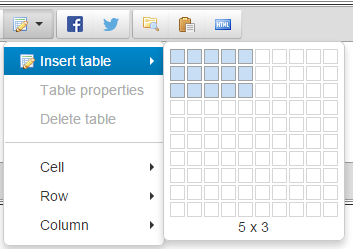 INSERT TABLE: This will create a table with the number of COLUMNS x ROWS indicated in the diagram - simply select the size and shape of the required table. Once the table is in place then you can input the data. Use the CELL, ROW and COLUMN options to change the formatting. For example if you wish to put the heading in BOLD then click on cell that contains a heading and select ROW->FORMATTING. You can use these options to add or remove rows, columns and cells too.